HYA is always looking for volunteers! If you are interested in giving your time, please contact Kenn Sutto by emailing Kenn[at]HomelessYouthAlliance.org. On the last Friday of every month, HYA staff and volunteers walk the streets of Haight Ashbury, the east end of Golden Gate and Panhandle Parks, and surrounding neighborhoods, properly disposing of trash, recyclables and syringes. Before every session, the Beautification Crew is thoroughly trained on safety protocol, including how to properly dispose of syringes and respond to accidental needle sticks. There are a lot of people in the Bay Area who own these things and don’t use them, and sometimes those people give them away for free. A FreeCycler for HYA would regularly check online community boards, such as Craigslist, Bay Area Freecycle, etc. for postings for any of these items, then pick them up and bring them to HYA, where we can connect those supplies with kids who need them. This is an easy way to get involved from home! Currently, we are not accepting new volunteers for our Needle Exchange nights; if you are interested in participating in the future, contact us! Of course, there are many, many ways to donate your time, especially if you have special skills or experience. Contact us if you’re interested in volunteering and we can work out the best way for you to get involved! BREAKING NEWS: After 12 years, a refuge for homeless youth will close our Drop-In doors Christmas Day. 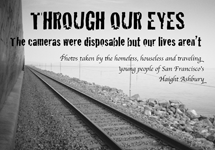 ••• // © 2019 Homeless Youth Alliance | San Francisco All Rights Reserved.